1. We believe the BIBLE / HOLY SCRIPTURES is/are the inspired, the only INFALLIBLE, AUTHORITATIVE WORD OF GOD, the GOD of Avraham (Abraham), Yitzchak (Isaac) and Ya’akov (Jacob). We believe that the HOLY SCRIPTURES as given in the original language (Hebrew) are DIVINELY INSPIRED and WITHOUT ERROR. The HOLY SCRIPTURES are our SUPREME AUTHORITY in all matters of FAITH and CONDUCT. The above are their SACRED Hebrew Names. In these last days, we are required to know these names and call upon them for help, etc especially GOD THE SON’S name!!! N/B: The King James Bible originally printed in 1611 as well as the other Bible versions printed before the year 1611 bear GOD’S original Hebrew Sacred Names as above. (A:vi, S: v)4“Sh’ma, Yisra’el! Adonai Eloheinu,Adonai echad [Hear, Isra’el! Adonai our God, Adonai is one]; 5 and you are to love Adonai your God with all your heart, all your being and all your resources. 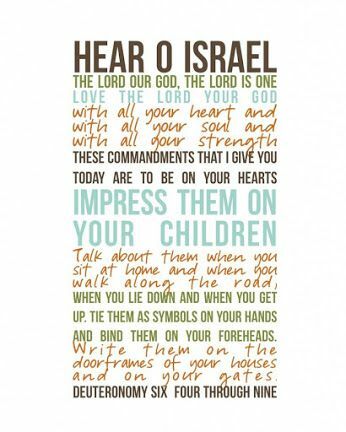 6 These words, which I am ordering you today, are to be on your heart; 7 and you are to teach them carefully to your children. You are to talk about them when you sit at home, when you are travelling on the road, when you lie down and when you get up. 8 Tie them on your hand as a sign, put them at the front of a headband around your forehead, 9 and write them on the door-frames of your house and on your gates. 4. We believe in using the Sacred Hebrew Names of the HOLY TRINITY GODHEAD as stated above. 5. 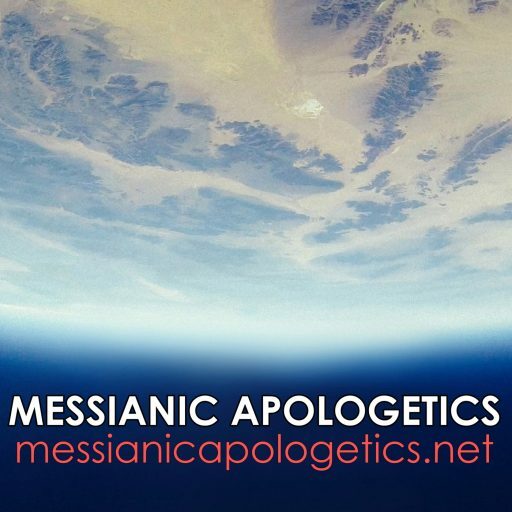 We believe that the HOLY TRINITY GODHEAD created the Heavens and the earth in the beginning as stated in Ha-Sefer Bereshith / Book of Genesis 1. 6. We believe that there is ONLY ONE TRUE MASHIACH / MESSIAH and that is YAHUSHUA who is well known around the world as JESUS CHRIST / YESHUA. 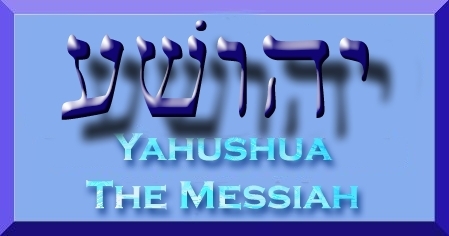 Our Messiah came to earth over 2000 years ago to carry out an important mission that pertains to the human race and then went back to heaven and is seated at the right hand of GOD THE FATHER, YAHUVEH / YAHWEH. 7. We believe that (as stated in Yahuchanan / John 3:16), GOD THE FATHER sent HIS SON, YAHUSHUA HA MASHIACH to the earth more than 2000 years ago to die on the cross for we, mankind’s sin. YAHUSHUA HA MASHIACH was a PLEASING SIN SACRIFICE unto ABBA YAHUVEH / YAHWEH that we may be reconciled unto ABBA YAHUVEH / YAHWEH and also have a chance to spend eternity with YAH in the Shammayim (Heavens) after death. 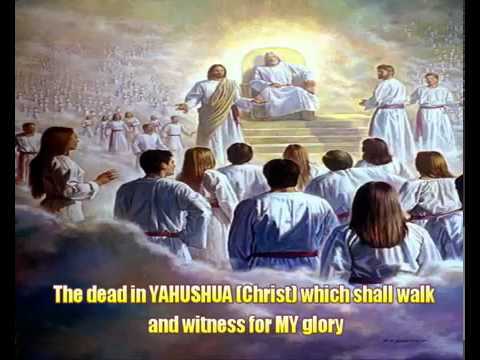 YAHUSHUA is the LAMB of YAH, MEDIATOR / HIGH PRIEST and the only WAY back to the FATHER in Heaven!!!! 8. We believe in the POWER of the shed BLOOD OF THE LAMB OF YAH – YAHUSHUA HA MASHIACH for, “We OVERCOME by the BLOOD of the LAMB and WORD of our TESTIMONY” (Hisgalus (a.k.a Chizayon) / Revelation 12:11! 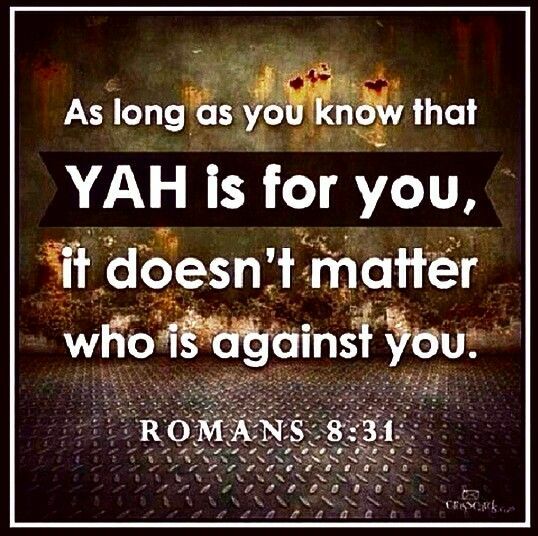 We believe YAHUSHUA ha MASHIACH has complete victory over satan and the kingdom of hell. 9. We believe in the BAPTISM BY IMMERSION IN WATER (also known as Mikvah after confessing YAHUSHUA HA MASHIACH as LORD and SAVIOUR as well as baptism by the RUACH HA KODESH (HOLY SPIRIT) with evidence, such as, speaking in HOLY TONGUES / Prayer Language, the manifestation of the GIFTS and FRUIT of the RUACH HA KODESH (HOLY SPIRIT) as well as walking in Holy Signs and Wonders of the HOLY SPIRIT. 10. We believe that YAHUSHUA was conceived through (the power of) the RUACH HA KODESH / HOLY SPIRIT and born to a virgin named Miriam / Miryam (a.k.a Mary). His earthly (but not biological) father was Yosef (Joseph) while HIS biological (Heavenly) FATHER was YAHUVEH / YAHWEH. While on earth, although HE was partly raised in Egypt where HE was taken from the Land of Israel to Egypt in order for him to be protected from King Herod (who commanded all children two years and under to be killed at that time), YAHUSHUA was an Israelite, born and raised in the Land of Israel. YAHUSHUA’S original / birth name therefore can therefore not be JESUS CHRIST because Jesus Christ is Greek / Latin name. 11. We believe that when YAHUSHUA was EIGHT DAYS OLD, he was CIRCUMCISED and then named “YAHUSHUA” as commanded by YAHUVEH through Malak Gabriyah (a.k.a Angel Gabriel) – Luke 1:26-38; 20:21. YAHUSHUA was later dedicated to YAH by Anna and Simeon when he was forty days old. YAHUSHUA was then BAPTISED BY IMMERSION IN WATER by Yahuchanan Ha Mikveh / John the Baptist around age 30 (before commencing ministry) in the Yarden / River Jordan and then immediately BAPTISED by the RUACH HA KODESH in the form of a dove. The dove was sent from by the Shammayim (Heaven) to sit on HIS shoulder. As the Dove sat on YAHUSHUA’S shoulder, ABBA YAHUVEH / YAHWEH spoke from the Shammayim saying that,“Behold, this is my SON with whom I AM well pleased” (Mattityahu / Matthew 3:13-17; Luke 2:22-40). We therefore believe that when babies are born, they are to be NAMED BY THEIR FATHERS on the EIGHTH DAY after their birth and subsequently DEDICATED unto YAH on the FORTIETH DAY from their day of birth. In addition, If they are BOYS, they have to be CIRCUMCISED(https://yahushua-thechiefcornerstone.com/circumcision-important-abrahamic-covenant/) as commanded by YAH (Bereshith / Genesis 17-18; Exodus 4:24-26).We have learned recently that there is a SPECIAL ANOINTING AND BLESSING hat comes from YAH when one obeys HIM byFAITHFULLY CARRYING OUT the command of BRIT MILAH / CIRCUMCISION from YAH. These are VERY IMPORTANT AND SPECIAL CEREMONIES that call for CELEBRATION / PARTYING. 12. When the babies / children grow up and with understanding CONFESS YAHUSHUA as their MASHIACH and SAVIOUR, then they can be BAPTISED BY IMMERSION IN WATER and BAPTISM BY THE HOLY SPIRIT (Mark 16:16; Acts 2; Acts 8). 13. While on this earth, we are called by YAH to accept YAHUSHUA as our MASHIACH / SAVIOUR through a WORD OF PRAYER (https://yahushua-thechiefcornerstone.com/salvation-prayer/) in which we DECLARE that we believe in YAHUSHUA’S VIRGIN BIRTH, DEATH (BLOOD SACRIFICE) and RESURRECTION on earth and later HIS ASCENSION to Heaven, ask GOD THE FATHER to wash us CLEAN from all our SINS with HIS SON, YAHUSHUA’S BLOOD. This is called BEING BORN AGAIN (spiritually). The OLD MAN is done away with and the NEW MAN is BIRTHED! After accepting YAHUSHUA as our LORD and SAVIOUR, we are commanded to be BAPTISED BY IMMERSION IN WATER as well as be BAPTISED BY THE HOLY SPIRIT! One evidence of being BAPTISEDin the HOLY SPIRIT is the RECEIPT of a Heavenly language (a.k.a speaking in HOLY TONGUES) inspired only by the HOLY SPIRIT. We are also given gifts by the HOLY SPIRIT which we are meant to use to GOD’S glory and produce good fruit. 14. We believe that YAHUSHUA was crucified and died at Golgotha / Calvary (means place of the skull in Hebrew). 15. We believe that YAHUSHUA was mostly based in eretz Y’israel (the land of Israel) and obviously spoke in Hebrew and Aramaic. YAHUSHUA was born in Bethlehem (means the House of Bread in Hebrew) in the land of Yahudah / Judah. YAHUSHUA was born as a Jew. HIS earthly parents, Miryam and Yosef were Jewish (born in the Israelite royal tribe of YAHUDAH / JUDAH). Remember also, that one of YAHUSHUA’S descendants was Melek Dawid / King David and Melek Sh’lomo / King Solomon who were born within the tribe of YAHUDAH. YAHUSHUA was raised in Yahudim / Jewish culture. HE therefore observed the HOLY (only) customs and traditions that the Orthodox Jews still practise to-date. These include: the yearly MOEDIM (Feasts of YAH) as set by YAH HIMSELF (not man!). Therefore, everyone that accepts YAHUSHUA HA MASHIACH as their LORD and SAVIOUR is to accept HIS JEWISHNESS (JEWISHNESS OF THE MESSIAH). 16. We believe in the SPIRITUAL UNITY of all BELIEVERS in the MESSIAH YAHUSHUA. We believe that the Jewish followers of YAHUSHUA HA MASHIACH are called to maintain their BIBLICAL JEWISH HERITAGE and to remain part of their people ISRAELas well as of the UNIVERSAL BODY OF BELIEVERS. This is part of their IDENTITY and a WITNESS to GOD’S faithfulness. We believe that GENTILE BELIEVERS in MESSIAH are GRAFTED into the CULTIVATED OLIVE TREE which is also JEWISH OLIVE TREE (Romans 11) and thus are encouraged to understand and APPRECIATE THEIR ROOTS, and to SUPPORT THE INTEREST of the Jewish people around the world. Romans 11:11-31 (emphasis on verse 19) which says that, 19 Then you will say, “Branches were broken off so that I might be grafted in.” 20 That is true. They were broken off because of their unbelief, but you stand fast through faith. So do not become proud, but fear. 21 For if God did not spare the natural branches, neither will he spare you. 18. 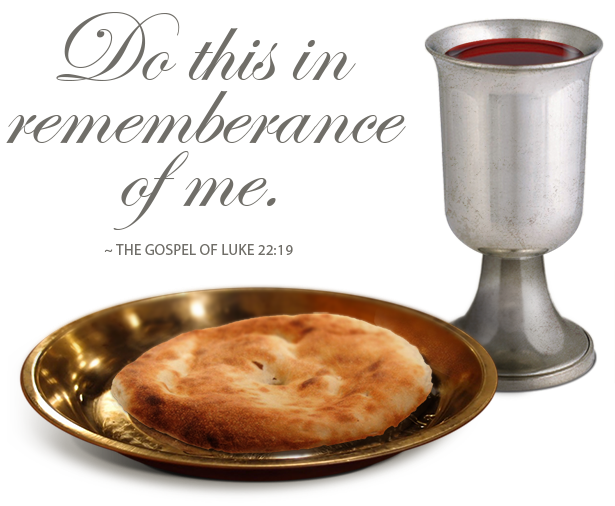 YAHUSHUA repeatedly said as seen in the Gospels that, 34 Yeshua said to them, “My food is to do what the one who sent me wants and to bring his work to completion. (Yahuchanan / John 4:34). In addition, 19 Therefore, Yeshua said this to them: “Yes, indeed! I tell you that the Son cannot do anything on his own, but only what he sees the Father doing; whatever the Father does, the Son does too. 20 For the Father loves the Son and shows him everything he does; and he will show him even greater things than these, so that you will be amazed. 21 Just as the Father raises the dead and makes them alive, so too the Son makes alive anyone he wants (Yahuchanan / John 5:19-21). We are therefore to do as YAHUSHUA did. 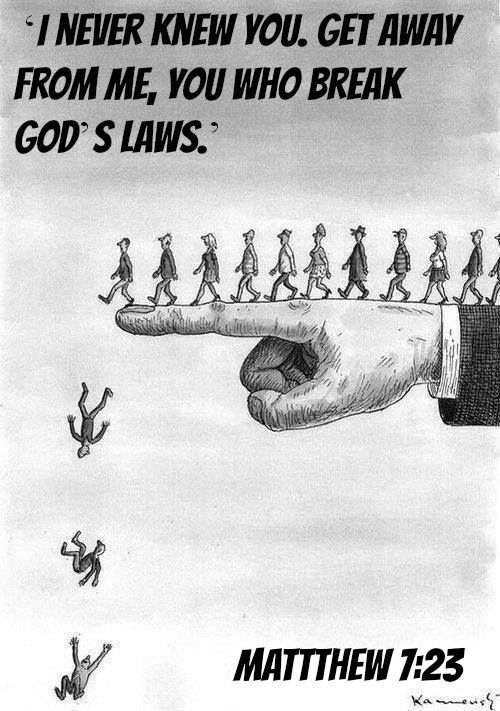 We are to walk in HIS footsteps with HIS guidance continually. 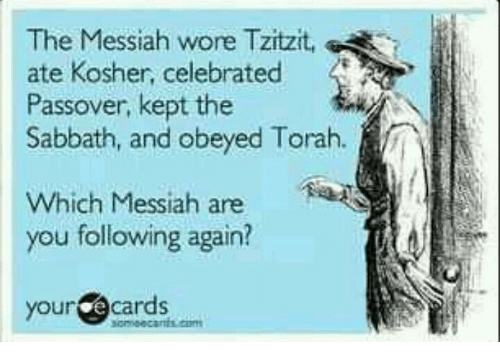 We believe that BOYS AND MEN should wear TZITZIT on their clothes (in a visible manner preferably on trousers) in obedience to the COMMANDMENT (MITZVAH) given by YAH after the CHILDREN OF ISRAEL had left the Land of Mitzrayim / Egypt (Ref – http://www.eliyah.com/transcripts/html/20141108.html). Numbers 15:38 – “Speak to the children of Israel: Tell them to make tassels on the corners of their garments throughout their generations, and to put a blue thread in the tassels of the corners. 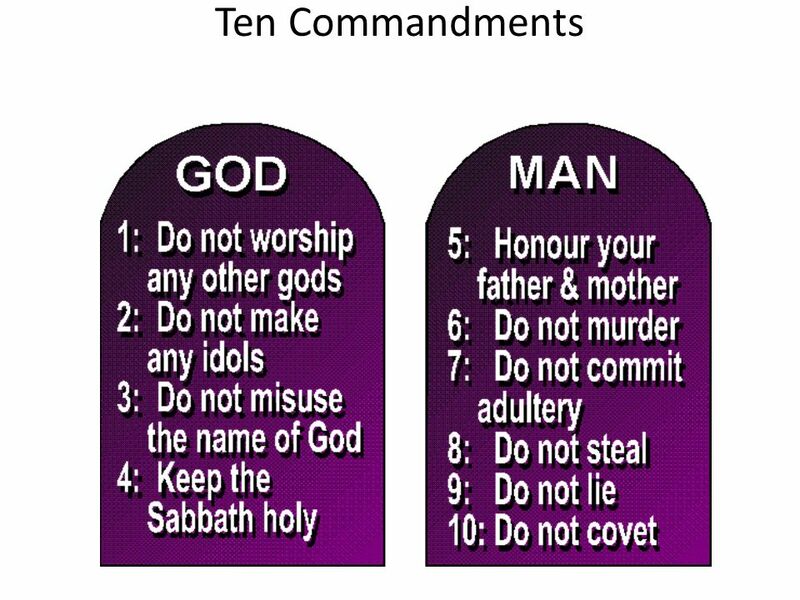 40 – “and that you may remember and do all My commandments, and be holy for your Elohim. We believe in eating Kosher Food (https://yahushua-thechiefcornerstone.com/kosher-explained/), that is to say Food deemed Clean by GOD ALMIGHTY. Having read the TORAH (the first five books of the BIBLE OLD TESTAMENT), we have learned that it is not everything GOD created on earth we are to eat. GOD told Noah what animals to take into the ark in two categories, that was CLEAN and UNCLEAN. When GOD gives the commandment in the books of Leviticus and Numbers concerning what and what not to eat, HE associates it with HOLINESS. This is because whatever we eat physically affects us spiritually. Every physical thing on earth has a representation in the spiritual realm. Let us keep in mind that YOU ARE WHAT YOU EAT! 18. We believe that as we approach YAH’S throne, we both men and women should have our heads covered with a prayer cover (TALLIT). The men too CAN wear KIPPAS or YARMULKES on their heads preferably WHITE if they please (NOT MANDATORY). The women can also use hats or scalves to cover their heads when praying to YAH. 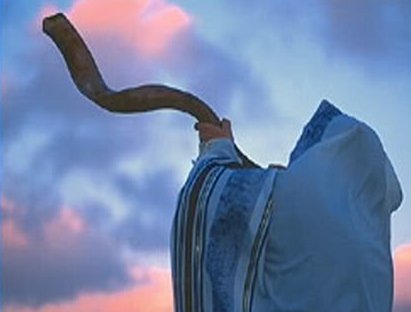 YAHUSHUA HA MASHIACH always covered his head with a tallit when praying to HIS HEAVENLY FATHER and so should we. It is a constant reminder to us that YAH is greater than us and we are reverencing HIM in all we do. IT IS NOT A MUST and we will not always wear white to services however, we do encourage YAH’S people to wear white colours quite a lot more especially during the FEASTS OF YAH as a sign of desiring and reflecting what should be in the spiritual realm. When we accept YAHUSHUA as our LORD and SAVIOUR, and washed by HIS BLOOD, we automatically become YAHUSHUA’S BRIDE or GUEST as pre-determined by GOD THE FATHER. As we all know, in physical realm, a bride has to dress in a certain way in preparation for as well as on her wedding day. We as YAHUSHUA’S BRIDE and GUESTS are commanded to be HOLY as YAH is HOLY! One symbol of holiness is white (clothing). 16 Because it says in the Torah, KEDOSHIM TIH’YU KI KADOSH ANI (“You must be holy ones for I am holy” VAYIKRA 19:2). All of YAH’s people and angels in Heaven wear white clothes always. Even YAH HIMSELF wears white clothes. Every other colour is for decoration. When all colours mix together, science says that the end result is the WHITE colour. As Spiritual Brides and Guests of YAHUSHUA on this earth, we are daily preparing to attend the MARRIAGE / WEDDING SUPPER that YAH is getting ready for us. 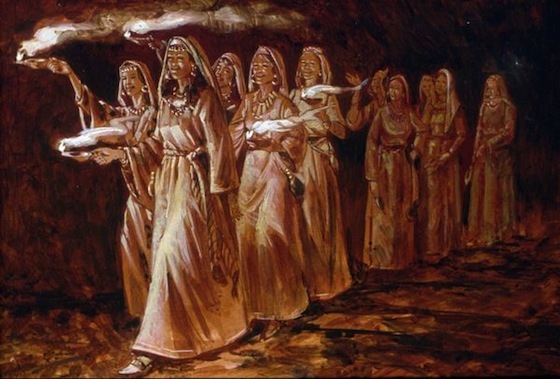 The Parable of the Ten Virgins in Matthew 25 explains all about it. When we become YAHUSHUA’S BRIDE and GUESTS, we receive a new garment on our spirit bodies in the spiritual realm. This garment is pure white (spotless). Every time we sin, spots appear in the garment in the spiritual realm. This makes us unclean before YAH. This is why, we are to constantly ask YAH for forgiveness of sins and to be washed by the BLOOD OF YAHUSHUA. The white garment is to distinguish us as YAH’S people. We also begin to illuminate the LIGHT OF YAH. The LIGHT OF YAH is pure. It is also white. White is therefore a symbol of PURITY. Whenever we dress in white physically, we ask YAH to dress us in a pure white garment spiritually that we may be spiritually pure before HIM always. So , IT IS NOT A MUST and we will not always wear white to services, but we encourage YAH’S people, if possible to wear white (even if it is just a top) when going for fellowship or during the observation of the FEASTS OF YAH particularly YOM KIPPUR / DAY OF ATONEMENT in the month of Tishri. 20. We believe in working towards bearing good physical and spiritual fruit as listed in Galatians 5:22-23 (the Fruit of the RUACH HA KODESH). These Holy Fruit are to be presented to YAH in Heaven on Judgement day after which HE will reward us accordingly. 21. Finally, we believe in the testimony of Enoch / Enosh (Genesis 5:23) and Elijah / Eliyahu (2 Kings 2), who were translated to Heaven because of their faithfulness to YAH while on earth! YAHUSHUA is the Holy Spiritual Bridegroom who willingly sacrificed HIS life for us (as the only perfect and acceptable LAMB OF YEAH / GOD ALMIGHTY). We that have accepted YAHUSHUA HA MASHIACH and lovingly obediently walk with HIM daily are HIS BRIDE and GUESTS depending on how GOD THE FATHER has determined from the beginning of time / pre-determined. In the FATHER’S time, we are to be translated to Heaven just like Enoch and Elijah. This is commonly known as the rapture of the saints. Some of us will have to be tortured and killed for our faaaith in YAHUSHUA HA MASHIACH though because YAHUSHUA and HIS Disciples who later became HIS Apostles experienced the same and they are the foundation of our faith together with the Prophets of old. 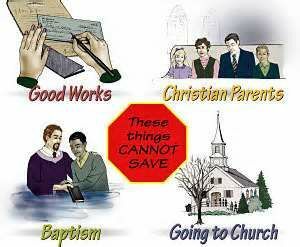 Read the Four Gospels and the Book of Acts of Apostles to understand the issue suffering. 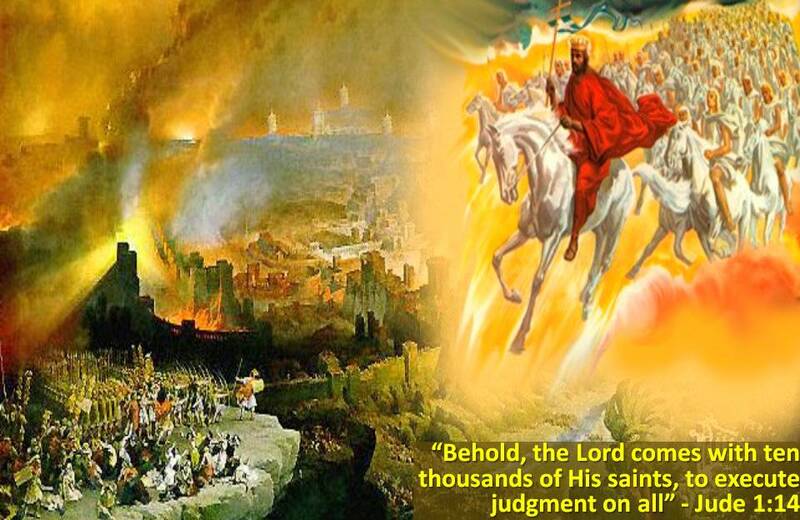 Also read the books of Thessalonians and Revelation as well as Matthew 24 to understand the issue of the rapture of the saints or the harvest of YAHUSHUA’S fruit (a.k.a people / faithful obedient followers).